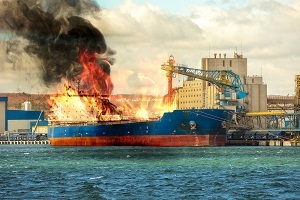 Maritime vessels typically have plenty of fuel and other combustible materials aboard, so when a fire breaks out the damage is often catastrophic. There aren’t any firefighters waiting to assist you when you’re at sea, and available firefighting equipment is limited. Similarly, it’s difficult to cope with burns or smoke inhalation injuries while at sea. Engine room leaks. Engine rooms are ideal environments for fostering a fire, and most ship fires start here. Fires require three things in order to ignite and sustain themselves: air, fuel, and heat. Engine rooms meet all of these requirements, since they have machinery operating at high temperatures, plenty of fuel running through high-pressure pipes, and lots of exhaust gases. A small fuel spray igniting on a hot surface is all it takes to start a devastating blaze. Oily rags. Rags are frequently utilized to maintain and clean machinery aboard ships, so used rags contain oil and other lubricants. Not only is oil highly flammable, it can actually self-ignite at high temperatures. Accommodation and cargo fires. Vessel accommodation fires are similar to any other fire, which can begin in any dwelling. They are generally caused either by an electrical fault or human error, such as careless disposal of cigarettes or failure to turn off galley stoves. If there is combustible cargo aboard the ship, improper disposal of cigarettes or leaving cargo lights turned on can lead to a fire. Vessel fires can cause serious injuries or illness, including burns, respiratory problems, and lung damage from smoke inhalation. If you’ve been injured due to a fire aboard a ship, you need an experienced maritime attorney to help you receive the compensation you deserve. To learn more about what the law offices of Steve M. Lee, P.C., can do for you, visit us on Facebook. How Do You Determine If a Vessel Is Seaworthy?